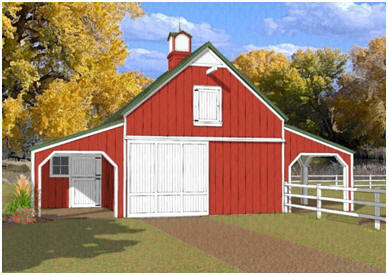 The Chestnut Valley Barn has three stalls with shady roofs in front of their big Dutch doors. With the big sliding alley doors and the top panels of the Dutch doors open, this is breezy barn that's great for warm locations. Enclosed floor area is 600 sq. ft. The Sheltered area is 360 sq.ft. The loft is 480 sq.ft.